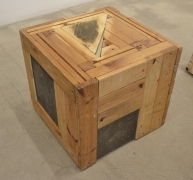 A Modest Inquiry into the Nature of Witchcraft, 2015, Salvaged furniture from closed Chicago public schools, 3 feet 5 inches x 5 feet 3 inches x 1 foot 4 inches. 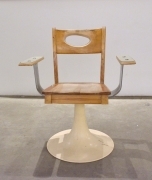 Civil Defense-Partial Dining set (Set of 2), 2015, Salvaged furniture from closed Chicago public schools, 31.5 x 27 x 15.5 inches. 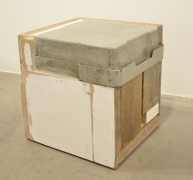 Incidental Panel, 2014, Salvaged material, 37 x 26 inches. 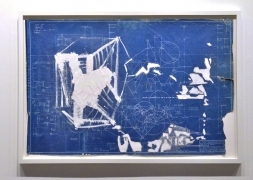 Oracle 2, 2014, Mixed media on retired CPS Blueprint, 26.25 x 38.25 inches, framed. 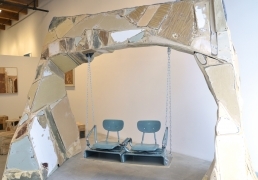 Swingset, 2015, Materials salvaged from recently closed Chicago public schools, 8 feet x 9 feet 5 inches x 5 feet 5 inches. Tauroctony, 2016, Angel-grinder drawing on wood panel, salvaged furniture from closed Chicago public schools, 23 x 26.5 inches. 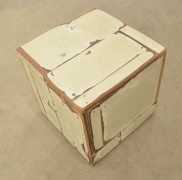 Chicago Archive Series - Infinite Set, 2013-15, Materials salvaged from recently closed Chicago public schools, 14 x 14 x 14 inches. John Preus (American, b. 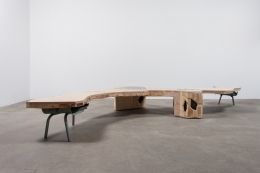 1971) is a a Chicago-based trans-disciplinary artist, designer and furniture-maker. 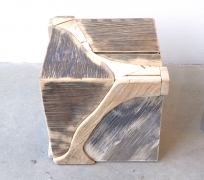 Preus founded Dilettante Studios in 2010, co-founded SHoP with Laura Shaeffer (2011), and Material Exchange with Sara Black (2005). 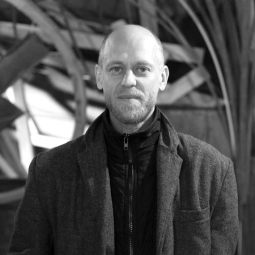 Preus was the creative director of Theaster Gates’ Rebuild Foundation shop until 2012 and project lead for Theaster Gates’ 12 Ballads for Huguenot House at Documenta 13. 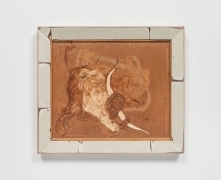 Selected solo exhibitions include, The Beast: Herd Mentality at Montserrat College of Art, Beverly, MA, John Preus: New Work at Rena Bransten Gallery in San Francisco, The Relative Appetite of Hungry Ghosts at Rhona Hoffman Gallery in Chicago, John Preus On Drawing at the Heilbronn Kunstverein in Germany, The Beast at The Hyde Park Art Center, Slow Sound at the Experimental Sound Studio.